Don’t waste time, whether it is your own or someone else’s. I don’t mean this harshly, but everyone’s time is precious—yours, the seller’s and the Agent’s. If you have no intention of purchasing a home, do not schedule a private showing (no matter how badly you “just want to see the inside.”) This is beyond inconsiderate—the sellers of the home have taken time to prepare for each showing by leaving the house, cleaning and readying it for a willing and able buyer. If you “just want to see it,” wait for the open house—you’ll be greeted with open arms and a cold drink! A little consideration goes a long way for both parties in a transaction. Keep in mind, consideration does not always mean money! All parties working together in a transaction will make for a much happier sale—after all, at the end of the day, everyone is on the same side—the side of the deal! Until the paperwork is signed and you have keys in your hand, you are in someone else’s home. It is never appropriate to handle personal items or “snoop” in someone else’s home—this includes walking the backyard or peering through windows without an appointment (creepy!). Be conscious that even though it may be a house for sale, it is still someone’s home. Unless you are the owner, you’re a supervised visitor and should always be respectful of other’s property. A “For Sale” sign is not an open invitation to trespass. Be loyal to your Agent and you will get loyalty in return. Agents work on commission, so Agents take it personally when you use them to run look at property but then write a contract with someone else. Have issues? Questions? Concerns? Your Agent wants to know. You have to communicate any issues as soon as they arise so they can be resolved. If there is no communication, there can be no solution (and who doesn’t love a good solution?). Try to be on time. We are all human and it’s no big deal—if you give a heads up. If you are running late, let the other party know. If you are house shopping and can’t make it, don’t stand up the Agent and the sellers, cancel the appointment. It’s just the courteous thing to do. Appointments can always be rescheduled. Yes, real estate is a “business decision,” but lets face it, it’s an emotional decision. With tight time frames and money, tempers tend to flare. 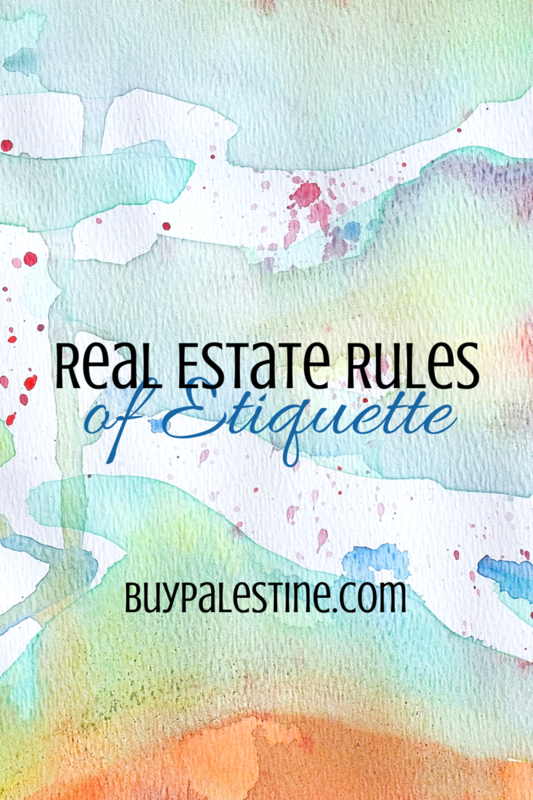 If you follow these simple rules of etiquette (or in a pinch, just go with Rule #1), you’ll be much happier and less stressed at the end of your Real Estate transaction. A great attitude can go a long way and a smile begets a smile—all the way to the closing table. Lisa E. Priest was taught to mind her P’s and Q’s and is a REALTOR® with Picket Fence Realty, Inc. You can reach her via phone or text at 903-948-3343 or at BuyPalestine.com.